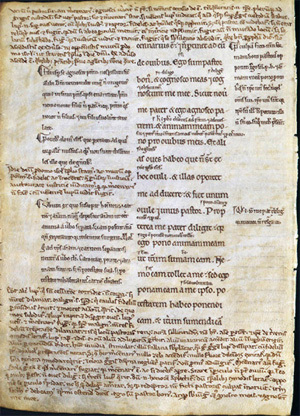 This early 12th century Swiss manuscript page (University of Saskatchewan Ege MS1) shows a page designed for annotation by later readers. The central column of text is from the Book of John. It was flanked by two columns of commentary and was written with sufficient leading (space between lines) to allow for interlinear glosses. Over the next century readers added annotations to all four margins.